UN Foundation and Devex — Making the Millennium Development Goals Happen » Extreme Hunger: Small Farmers to the Rescue? 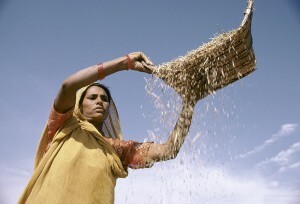 Home » Goal 1: Eradicate extreme poverty and hunger » Extreme Hunger: Small Farmers to the Rescue? Helping small farmers become more productive is the focus of recent global anti-hunger efforts. Such initiatives maybe crucial to achieving the first millennium development goal. For example, small farmers in Uganda are receiving aid to grow and market coffee as a cash crop. By growing cash crops, farmers can feed their families, generate greater income and increase the food supply. Small farmers in the developing world must overcome steep challenges such as lack of market access, high quality seeds and poor infrastructure. Droughts and other climate related issues compound these challenges. Overall, agricultural investment and aid have seen an increase over the last few years after being neglected for decades by governments and donors. Also, more enlightened food aid programs aimed at breaking dependency on donors are emerging. A growing number of partnerships between agribusiness, micro-lenders, donors and scientists are trying to address hunger holistically. But, will improving the livelihoods of small farmers help tackle hunger? How is your organization helping to address food insecurity? What success or set-backs have you faced? How might policymakers reduce hunger? Join. Be Heard. Start posting your comments and success stories now! This entry was posted on Tuesday, May 18th, 2010 at 11:42 pm	and is filed under Goal 1: Eradicate extreme poverty and hunger. You can follow any responses to this entry through the RSS 2.0 feed. You can leave a response, or trackback from your own site.